After our winter break, we came back together refreshed and ready for more fun! The New Year brought a new friend, Jaylynn, to our group! 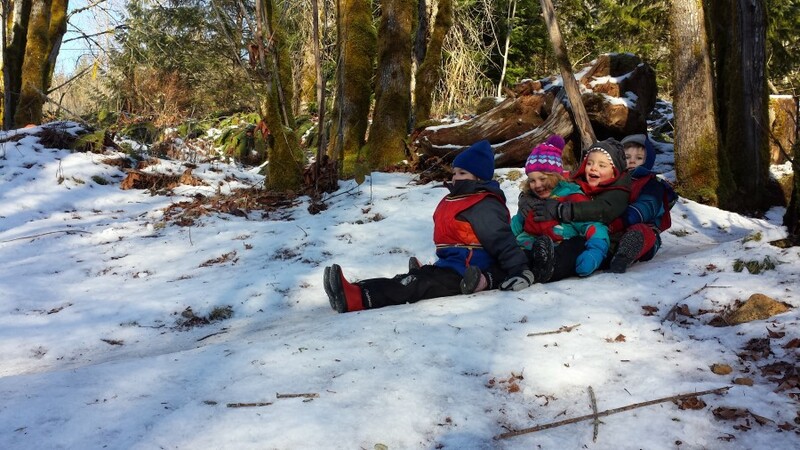 All of the children have been very welcoming to Jaylynn, and have helped her learn the ins and outs of forest preschool. It won’t be long now until she’s just one of the gang! We have also enjoyed visiting a new classroom – first by crossing the ice, and then via a very precarious and icy route. 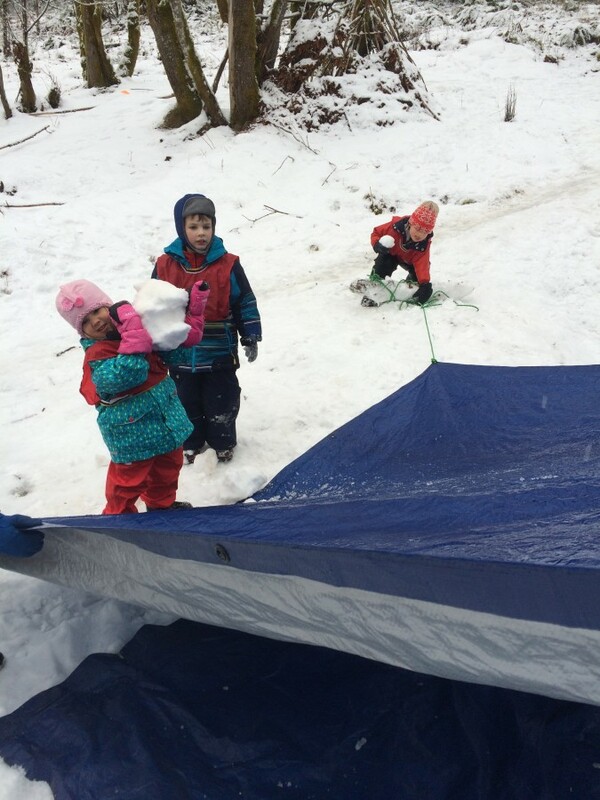 We will return to the slopeside classroom for sure, but likely not until things thaw out a bit! Moving over icy ground and navigating familiar terrain in different states has been challenging for everyone. 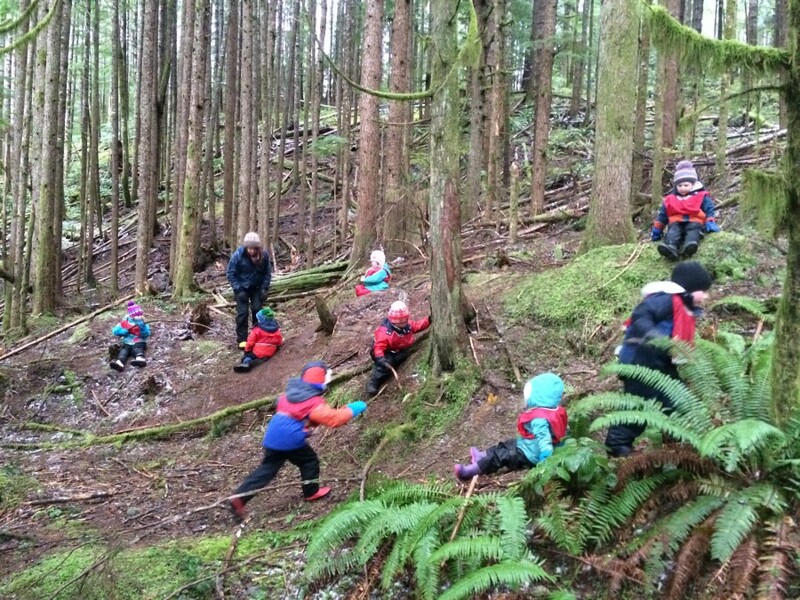 Our bodies are getting stronger, and the children are learning to assess where they step when travelling. 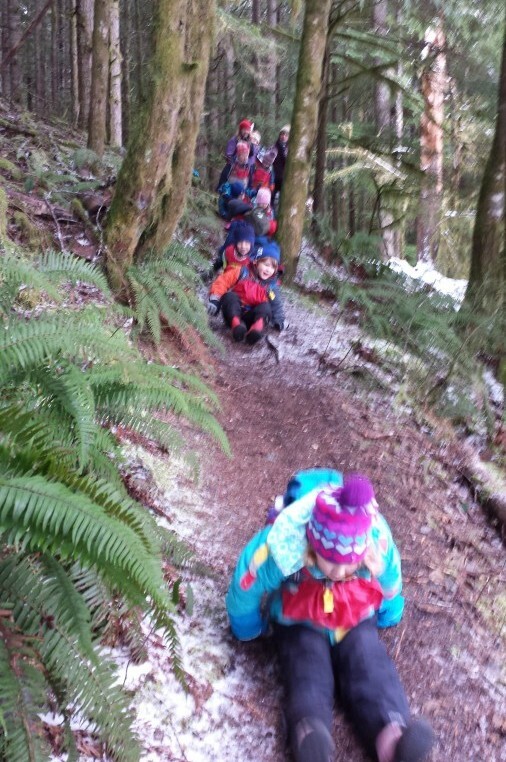 On our way to our newest classroom – this icy hill was very tricky to travel over. Coming down was fun – sliding all the way, but going up again was very challenging. Not to mention the wagon! Sliding on our bums has been a major mode of transportation lately! 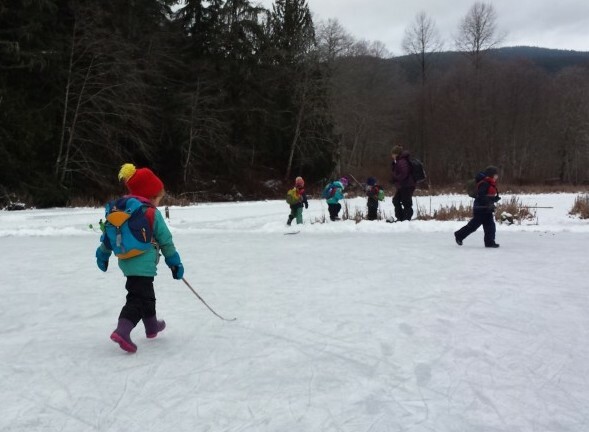 Exploring the frozen marsh let us explore ice travel in a different way – the wide open spaces, and the even surface let the children move more quickly than when we are in the forest. This is the slopeside classroom that was totally worth the effort to get here. The play possibilities that it presents are very dynamic! 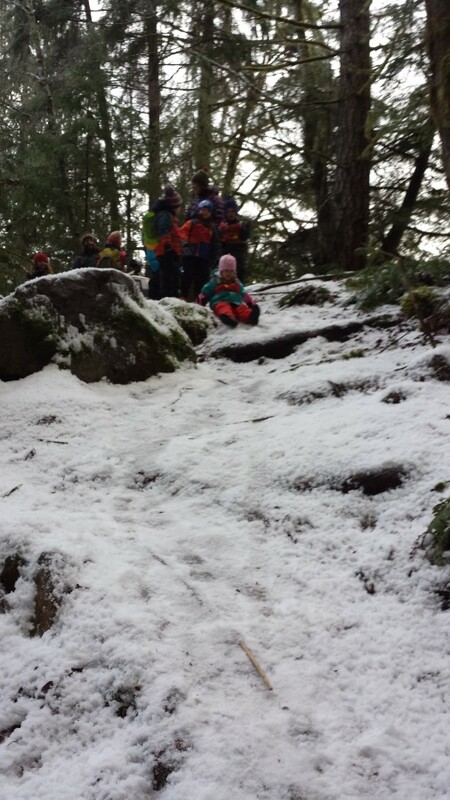 In addition to our new classroom, we have been visiting old favorites and experiencing them in winter conditions. 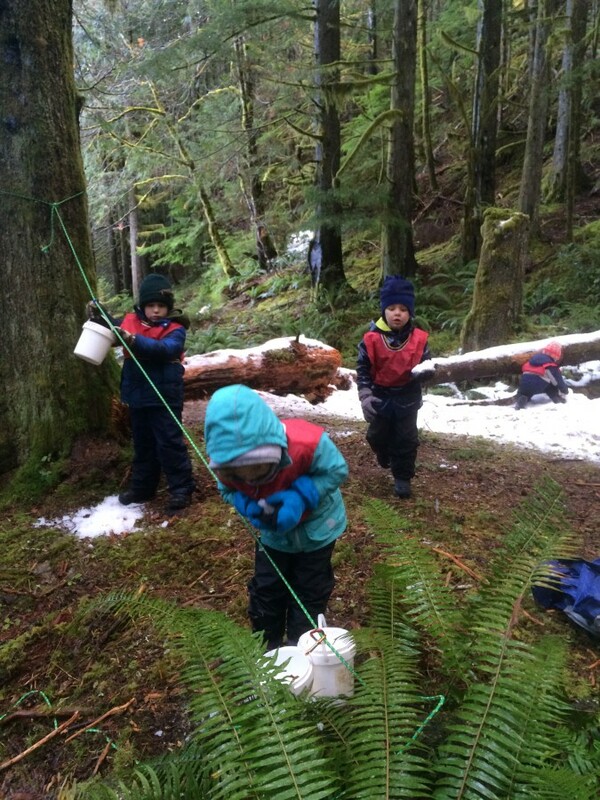 Here we are at the waterfall classroom where snow has added a new dimension to the bucket/zipline play. This hill was fun to slide down before snow! 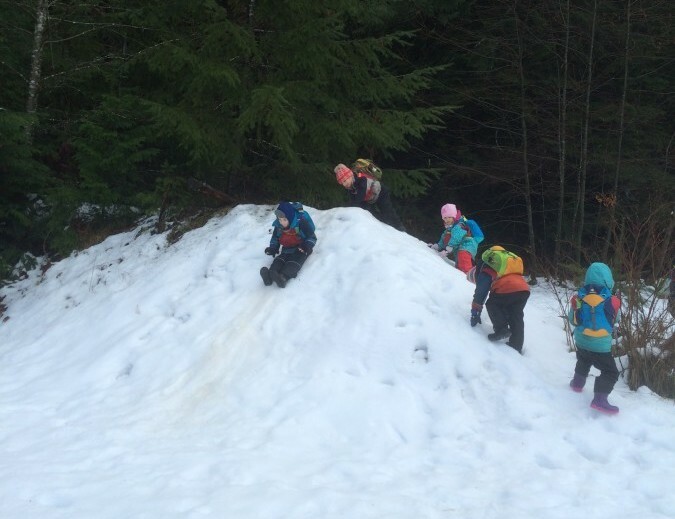 It may be harder to reach the top now, but the snow makes it even more fun! We also revisited the Sticks classroom, where a collaborative building project started. Finding all the sticks to build this nest, and working to free them from the frozen ground was a group effort. Here Trevor and Kieran are taking a break on the couch that James built.